A bill aimed at reducing the amount of salt used by commercial businesses that treat driveways, sidewalks and parking lots is getting traction this year in the Minnesota Legislature. The legislation would offer those companies liability protection from slip-and-fall lawsuits if they get trained and certified in better salting practices. Rep. Peter Fischer, DFL-Maplewood, is author of the House bill. He said it aims to cut down on one source of salt that's causing chloride pollution in lakes, rivers and groundwater. • Earlier: Could 'smart salting' keep Minnesota roads and waters safe? 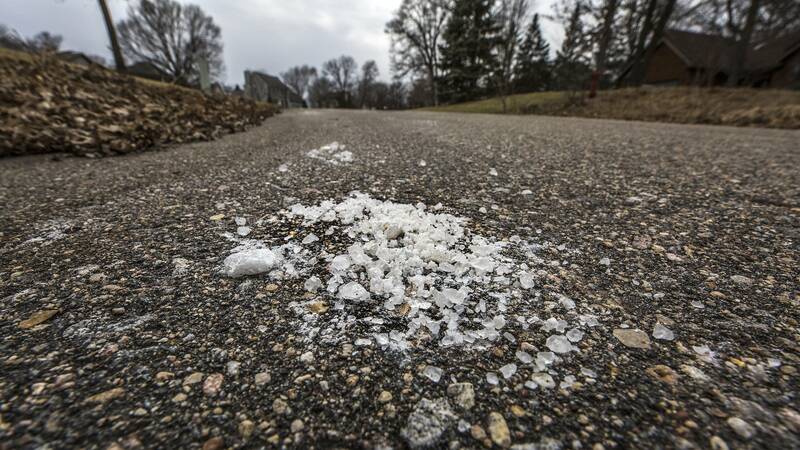 Minnesotans are accustomed to seeing salt scattered thickly on sidewalks and driveways during the winter, but Fischer said that's a sign of oversalting. "When people don't see that salt out there, they feel we're not doing the right thing," Fischer said. "There's always pressure from building owners and property managers to tell people applying de-icing chemicals and salt to use more." Chloride from road salt, water softeners and other sources is showing up in rising levels in lakes, streams and groundwater. About 50 Minnesota water bodies are considered impaired because of chloride levels. "The chloride in de-icers kills fish and hurts pets, and it's accumulating in drinking water sources, and ultimately costs millions of dollars in repairs to roads and bridges," said Jenna Grove with Clean Water Action, which supports the bill. • Earlier: Are there eco-friendly alternatives to road salt? Similar legislation failed to make it through end-of-session negotiations last year. But supporters are optimistic about its chances of passage this year. "The problem is that right now, over-application is believed to be the protection from lawsuits, instead of best practice," said Sue Nissen, an advocate with the group StopOverSalting, which has pushed the legislation for several years. "It's huge if we can get them into training and get them to feel like they don't have to over-apply in order to protect their small businesses," Nissen said. In metro areas, road salt is the biggest source of chloride pollution. Most of that salt is applied by public works agencies, but in recent years many of them have been working to reduce their salt use. The bill has the backing of the Minnesota Nursery and Landscape Association, whose 1,200 members includes businesses that remove snow and ice. Forrest Cyr, government affairs director, said members have a strong interest in reducing their salt use and using best management practices. But right now, the best liability protection "yields the worst possible outcome for Minnesota's lakes and rivers," Cyr said. Fischer's bill is awaiting a hearing in the House Judiciary Committee. A Senate version, authored by Sen. Carrie Ruud, R-Breezy Point, has not yet had a hearing.